Today I'm sharing a fun tag I created using the negative space of a die. I'm a big fan of numbers (and letters) and when I received this die from Sweet 'n Sassy and cut out the numbers I knew I just had to use the negative space as a stencil. I started by applying a few Distress Paint colors to a tag. (I watered down the paint on a craft sheet and the dragged the tag through the paint puddles; drying in between layers). 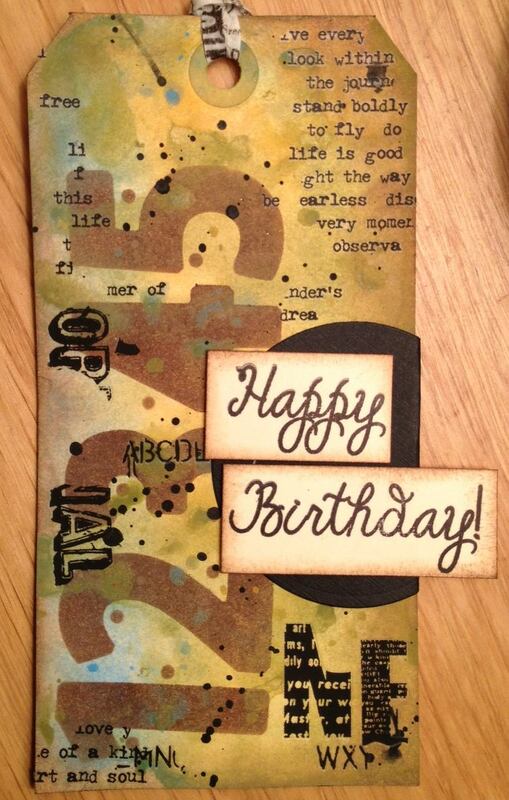 Next I grabbed my Gathered Twigs Distress Ink and a blending tool to add the numbers. I then added a bunch of rubs, from the Words and Numbers sets, a few paint flicks, and a half circle to house my birthday sentiment. Wouldn't this be a fun project to attach to a birthday present? Fun stuff! Enjoy today's tag and look for fun ways to make your own stencils!! Awesome tag! I never thought of using negative as stencil; cool idea. I love rub ons too! Wow, love how this turned out a bit more on the masculine side. Awesome way to use the negative and love the idea of combining those rub ons. Love the look of the negative as a stencil on this tag. The background is really rich in layers and random pattern. All of the colours and splotches look amazing. Great use of the rub-ons. I really like the way you drew attention to the sentiment with the circle behind it. Great detail. Love the use you put the leftovers to Kim..fab tag and might borrow this idea please! Hope all has settled down at home.